Is the Lost Decade Already Forgotten? — Center for Financial Planning, Inc.
Is the Lost Decade Already Forgotten? So you or your financial planner has taken the time to put together a well-diversified portfolio. Now what? Disappointed lately after opening your statements? Well you aren’t alone! Investors everywhere have been left wondering, “Why isn’t my portfolio up more when I keep hearing of the market hitting new highs this year?” It was not uncommon to see a diversified portfolio (40% S&P 500/20% MSCI Eafe/40% Barclays Capital Aggregate Bond Index) with a gain less than 5% for the 6 month time period ending June 30th 2013. That’s at the same time the S&P 500 gained more than 13% including dividends! Further diversify with commodities or real estate and your returns likely looked even worse. I’m referring to the 10 year time period throughout the 2000’s when the S&P 500 produced a negative total return. This was a very difficult time period starting with the burst of the dot-com bubble and ending with the financial crisis of 2008. Many felt like there was nowhere to hide during this time period. In reality however, those with a widely diversified portfolio had quite the opposite results. Sure a portion of their portfolio was flat to down but many of the other areas of their portfolio performed quite well over this decade, boosting their overall portfolio returns. 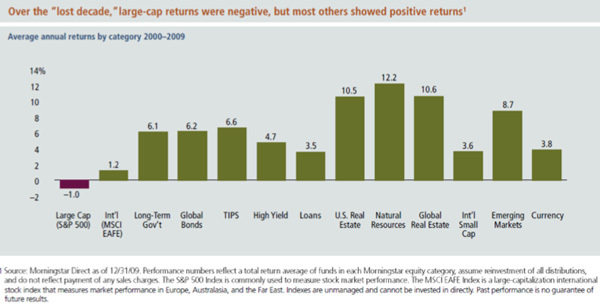 The chart below illustrates average annual returns from some of the major Morningstar categories from 2000-2009. The lost decade only applied to one type of investment one could own. Coming into this lost decade, investors were asking the very same questions we are hearing now and the chart above shows us how that ended. While we don’t believe we are on the doorstep of another lost decade, we do feel it is not the time to abandon diversification. So, when you open your statements this year, you may be left wondering, “Where’s the Beef?” But be careful before making any drastic changes to your portfolio. Talk to your financial planner first! Angela Palacios, CFP®is the Portfolio Manager at Center for Financial Planning, Inc. Angela specializes in Investment and Macro economic research. She is a frequent contributor to Money Centered as well asinvestment updates at The Center. The information contained in this report does not purport to be a complete description of the securities, markets, or developments referred to in this material. The information has been obtained from sources considered to be reliable, but we do not guarantee that the foregoing material is accurate or complete. Any information is not a complete summary or statement of all available data necessary for making an investment decision and does not constitute a recommendation. Any opinions are those of Angela Palacios and not necessarily those of RJFS or Raymond James. Past performance may not be indicative of future results. Diversification does not ensure a profit or guarantee against a loss.